Governor-General Michaëlle Jean has acknowledged Canada's failure to respond to the Rwandan genocide as part of the international community. During a state visit to the country Wednesday, she conveyed the guilt of the many nations accused of ignoring the 1994 crisis in a statement delivered during a meeting with President Paul Kagame, a leader of the Tutsi rebel uprising. memorial sites, hospitals, military sites, Canadian funded day care centers, slave trade sites, local civil society and NGO's and various other Canadian funded projects. On Friday April 16, in Dakar, Senegal Mr Peterson will participate in a panel discussion on the role of the media in the emergence of a new Africa, hosted by Michaëlle Jean. The panel discussion, organized by the Canadian Embassy in Senegal in cooperation with CESTII will take place at the University Cheikh Anta Diop in Dakar. For a complete itinerary please visit http://www.gg.ca/document.aspx?id=13586 For more information on the delegates please visit http://www.gg.ca/document.aspx?id=13584. Brothers of the Christian churches to teachers new technology, Canadian resources contributed significantly to education and training of generations of Africans. Many examples are there to show their importance.The '50s marked the real kickoff of training missions on African soil. In the wake of European settlers, mainly French and Belgian, French Canadians, as they were called at that time will be invested by the good graces of the Vatican to come to contribute to the educational efforts of a youth full ideological break. This will be followed later by involvement of the Canadian government spends, since a budget to the development of courses of training and learning. The formation of this skilled labor is even more important and necessary it can move more rapidly to a development control. Education and development of specific programs of vocational and technical training are popular and Canada's bilingualism is an asset non-negligible. What makes that radius organizations, we had already echoed the Association of Canadian Community Colleges (ACCC) which includes over a hundred institutions, technical institutes and vocational colleges and colleges. This group has already piloted the Program Canadian College Partnership, which was designed to encourage Canadian institutions to strengthen the capacity of educational institutions and training in developing countries to meet their priorities for sustainable growth. This project, conducted between 2001 and 2007 with funding from the Canadian International Development Agency (CIDA), had helped to achieve over 120 projects in various fields. In the same vein, a new program called Global Citizens was set up and will organize educational activities in real time between Canada and Caribbean countries and Africa. Students and teachers involved will have the opportunity to study the reduction of poverty and other development topics, which will give them an idea of ​​global problems and will increase the participation of young Canadians International Development. This initiative over two years, is one of the new elements of the modernized program of CIDA's partnerships, and is valued at $ 2.4 million. 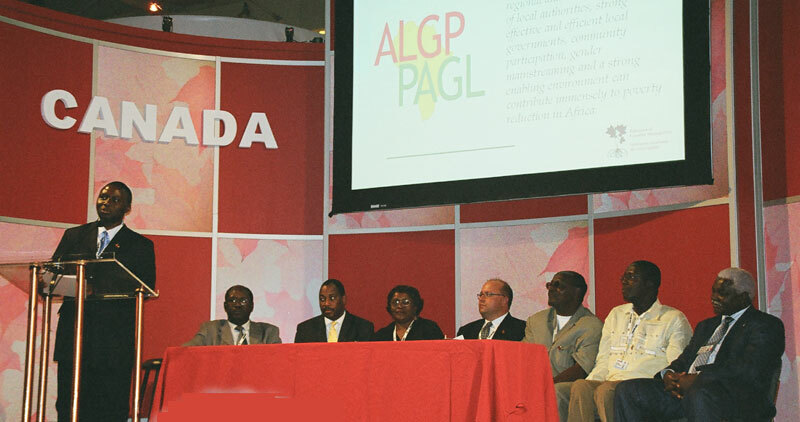 In the same vein, the Association of Universities and Colleges of Canada (AUCC) and its 95 member universities have completed more than 2,000 international development projects over the past 30 years, much of which in Africa .To this end, the focus was on improving human resources from other countries to help them raise their standard of living. In all, more than 150 scholarship programs, research and courses that are conducted on behalf of governments, foundations, and private sector companies. As shown, the public part is pretty well wrapped even though many lament the boom years of Canadian cooperation in which graduates of vocational schools were completing their training in North America. On the private side, finally, Canadian companies are now at the forefront of education and training. Which is a gain for African countries is also good for the Canadian groups, in "formatting" in some way these future workers or managers, also make sure to be a relay for the Canadian industry. Thus are born the markets induced in the wave of educational networks. We thus find regular Canadian resources in new technologies, industrial and civil engineering or management. Key areas for development. What a memorable week. After 30 years UN Habitat returns to its launching pad - the seaport city of Vancouver, British Columbia Canada. The crowd is estimated at 10,000 plus and it certainly seems so, judging by the heavy attendance at many sessions. 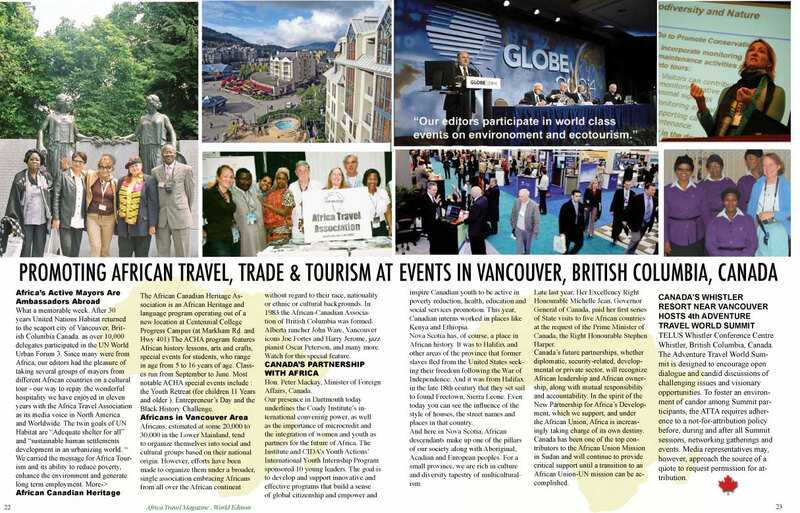 At the time of writing, we have had the pleasure of taking two groups of mayors representing different African countries on tours of Vancouver and the University of British Columbia. 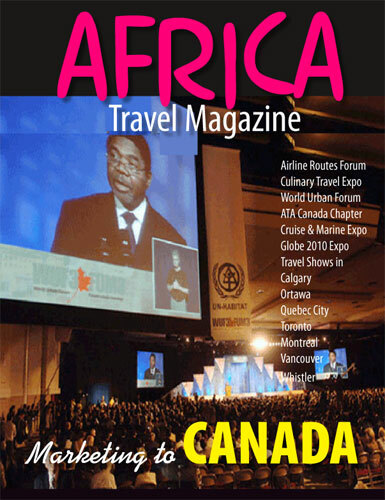 It's one way for us to repay the wonderful hospitality we have enjoyed in eleven years with the Africa Travel Association as its media voice in North America and Worldwide. 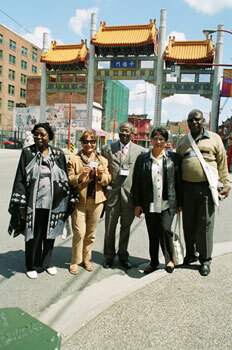 MORE ABOUT AFRICANS IN CANADA AND THE HISTORIC TIES BETWEEN OUR GOVERNMENTS - TO APPEAR ON THIS PAGE AND SECTION.